Are your kids enjoying their Summer? Make it even more fun with Flip Flop matching games and activities using these free cards! Here are 7, yes SEVEN, fun ideas on how you can use these cards and develop skills your kiddos will need for school! This is a good activity to start off with young children. 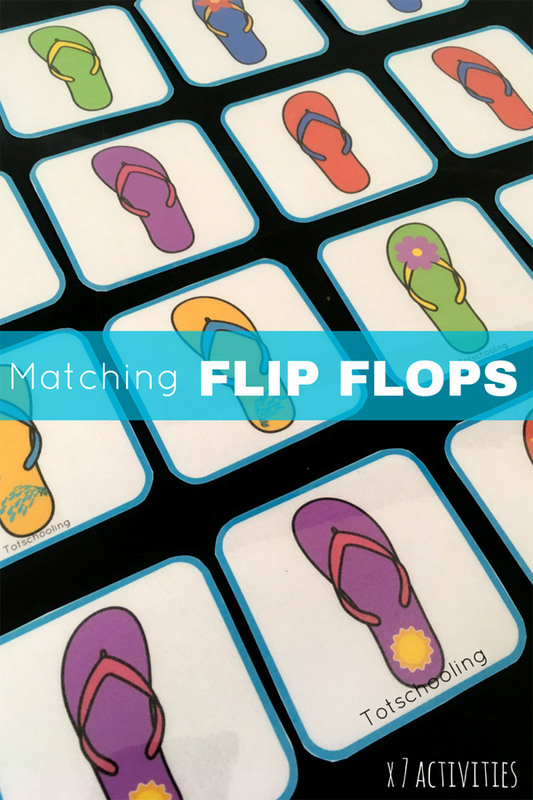 Simply match each Flip Flop with its pair, one by one. Say the colors to develop language and vocabulary. 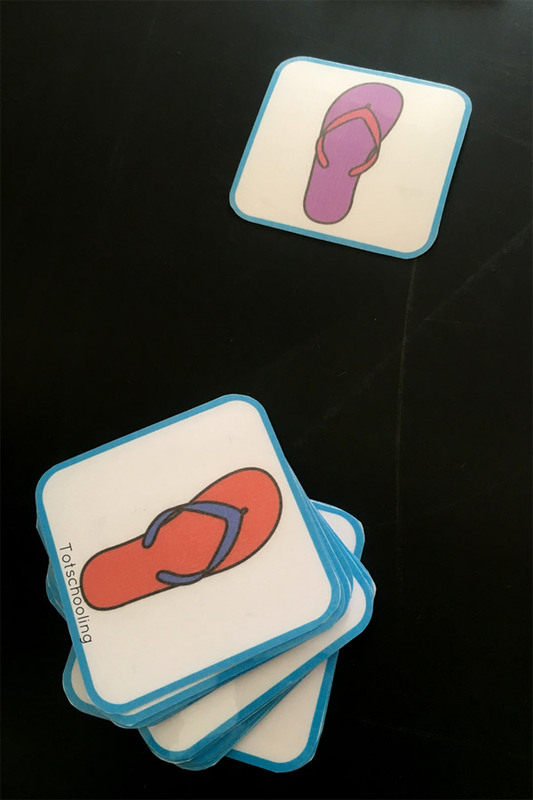 Turn the cards face down and play a memory game where a player turns two cards around hoping to find a pair. Remember where a certain color is and find all the pairs. Start with only a few pairs and add more the more confident the player(s) get. Use the pairs to count by twos (skip counting). 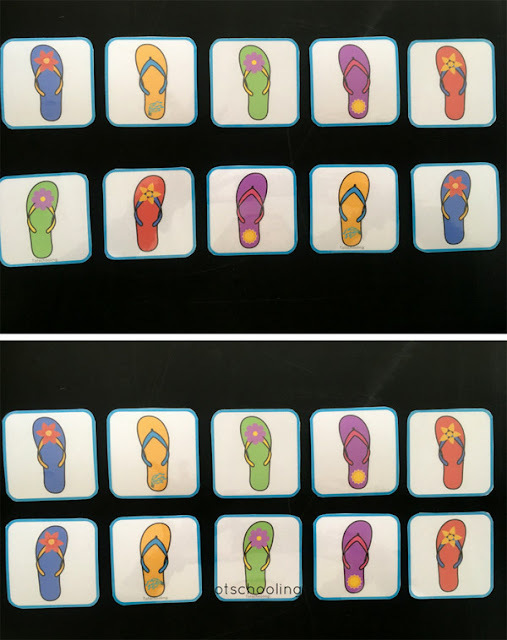 A great way to show the concept of skip counting with physical objects (the cards). 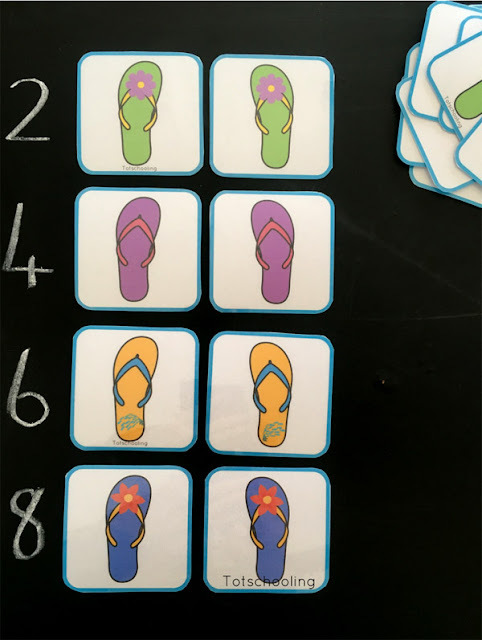 Choose a number and count out that number of Flip Flops. One can even do simple word sums using the cards. 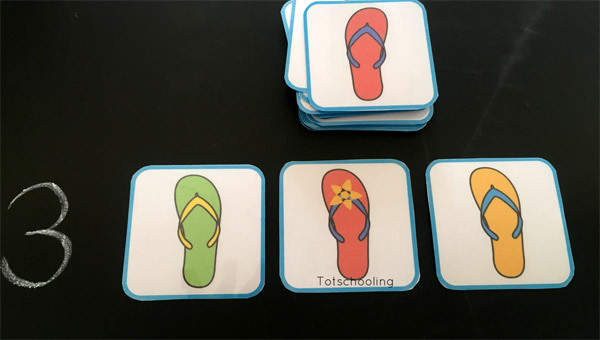 Example: "Mary has 4 pairs of Flip Flops. After a visit to the beach, one of the pairs got lost. How many does she have now?" Use the cards to expand visual memory. (Start with one card and then add more.) Show a card quickly. Ask the child to look for the matching one in his pile. If correct, show 2 cards. Do this until it is too challenging. Pack out a pattern with one of the pair. 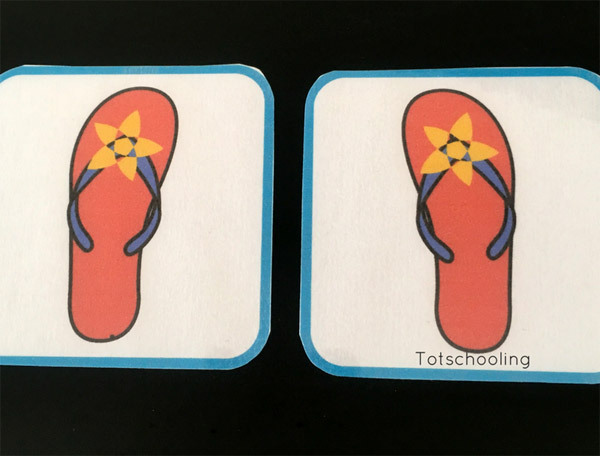 Place the other pair in the wrong order. Ask the child to "fix it up". Or, make a pattern(start with only 2 cards, then add more). Show the child the pattern for a few seconds. Cover up the pattern and ask the child to copy the pattern from memory. Place cards on a blackboard or whiteboard as shown in the image below. 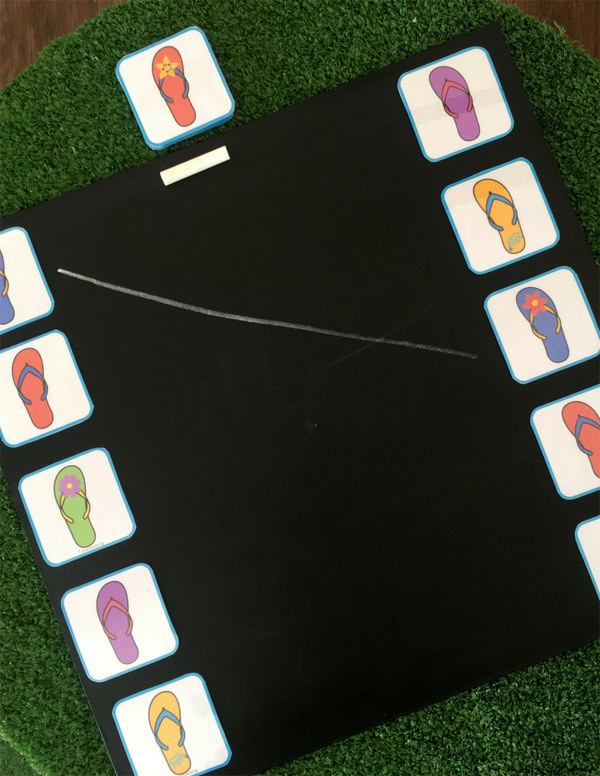 Ask the child to draw a line to match the pairs. This is a good activity to develop pre-writing skills, hand-eye coordination and spatial awareness. 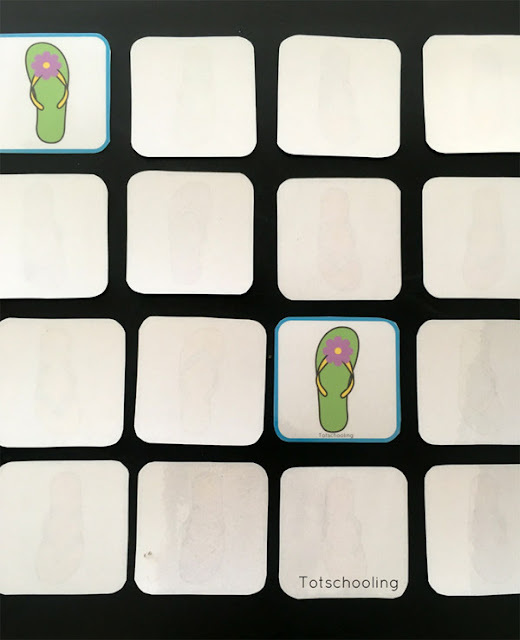 Such fun activities and that with only a pack of Flip Flop cards! Also check out this Garden Memory Game! really very nice and knowledgeable blog. I have visit so many time to this blog.Some genuinely interesting info , well written and loosely user pleasant. When I have spare time, I often read your posts. 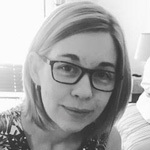 I want to enjoy more and more about your writing. I wish you best things in life.